We offer a full service to design and develop a database for your specific needs, we can use large file based databases for data analysis to In-Memory databases for those that require very fast access to the data. 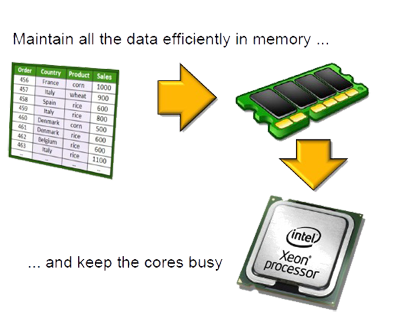 Depending on your requirements you can choose from an In-Memory database which as the name states stores the data in the computer's memory and provides very fast access for querying your data, this is when you need access to the information in the shortest possible time. The other type of database which is stored as a database file on your computer and has to read and write the information to disk, this is still extremely fast, but better for data analysis and number crunching. Microsoft SQL Server offers breakthrough in-memory performance built into the database for your transactions, your queries and your analytics delivers faster insights into any data with familiar analytics tools, and enables enterprise-ready Big Data solutions. You may want to store large amounts of data locally on your machine and query it from your automated strategy or even crunch the numbers for analysis, Microsoft SQL Server is a free download that would be perfect for this. Download Microsoft® SQL Server® 2014 Express with Advanced Services for free. As a trader you may find it useful to import historical data into SQL Server and use the Advanced Reporting Services for analysis, so when you install select Express with Advanced Services (SQLEXPRADV). An in-memory database system is a database management system that stores data entirely in main memory. This contrasts with traditional (on-disk) database systems, which are designed for data storage on persistent media. Because working with data in memory is much faster than writing to and reading from a file system, IMDSs can perform applications’ data management functions an order of magnitude faster. Because their design is typically simpler than that of on-disk databases, IMDSs can also impose significantly lower memory and CPU requirements. eXtremeDB Financial Edition meets the demanding performance and reliability needs of capital markets systems (algorithmic trading, risk management, etc.). Specialised features include columnar data layout, to accelerate management of time series data (market data); a library of vector-based statistical functions; and GUI-based performance monitoring provided as an application programming interface (API). MemSQL is a high-performance, in-memory database that combines the horizontal scalability of distributed systems with the familiarity of SQL. Using memory, MemSQL concurrently reads and writes data on a distributed system, enabling access to billions of records in seconds. MemSQL also includes a disk-based column store. Anything that can be expressed in SQL statements becomes available as quickly as data is captured. This enables easy integration with existing applications without costly query rewrites or custom connectors. An object database allows software developers to develop application data models, store them as objects, and replicate or modify existing objects to make new objects within the object database system. The database is integrated with the programming language, allowing the developer to maintain consistency within one environment since both the database system and the programming language will use the same model of representation.